Real change starts with rats. More specifically, the rats who have been eating the seeds at L’Arche Farms and Gardens. This is one of many problems that L’Arche Farms and Gardens presented to fourth graders to try and solve this year using the design-thinking process. Design thinking is an innovative problem-solving process that we have adapted from the d.school (Institute of Design) at Stanford University for fourth grade. Our goal is to help the students understand that they can change the world, especially if they start small. We started small ourselves when we introduced design thinking to students in the first weeks of the school year: We challenged ourselves to create the perfect customized backpack. We interviewed each other to learn what we each needed from such a storage receptacle, defined the problem with the existing product, ideated a multitude of solutions, prototyped new versions, and tested their ability to resolve what was lacking. In the end, we had rather haphazard homemade backpacks, but what is so educational about design thinking is the process from Point A to Point B. To that end, it was a success. We then looked to apply design thinking to a bigger problem. Though the fourth grade has been working with L’Arche Farms for nearly 20 years, this is the first year we have incorporated design thinking into our work with this organization. Two groups of 20 students began working in November to help create a potting and seed organization system that would be protected from the rats that found their way inside the potting shed. The first step in our process was empathy. The fourth graders created interview questions to seek stories from the members of the L’Arche community to better understand the problem. The empathy process helped the students determine what was most important to the people experiencing the problem so that they could accurately define the problem, which ended up being seed organization and pot storage. The next step was to ideate. The students brainstormed as many ideas as possible to solve the problem. The students were encouraged to dream big and without limits, as great solutions frequently emerged from wild first ideas. Next, students made sketches and diagrams of their ideas and voted to identify the concept most likely to succeed, most likely to delight the user, and the most breakthrough idea. This helped students identify which projects they should move forward with into prototyping. Hoards of recycled materials came in as students pieced together a 3D model of their team’s design. Students used tin foil to represent pots and toilet-paper tubes to hold up shelves in their organizing schemes. With taped-together prototypes in hand, the students were finally ready for testing. Members of the L’Arche community came to campus to be presented with 10 different ideas from small groups of students. After carefully listening to their feedback, fourth grade students will work to iterate on their design plans and implement a solution including all the key components identified by the L’Arche community. This large-scale, long-term project has been an impactful introduction to design thinking for our fourth graders. 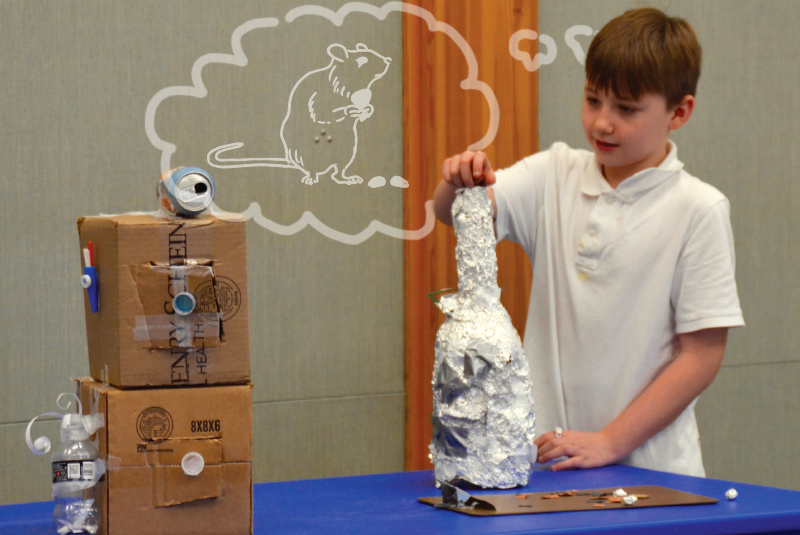 We want our students to be creative problem solvers in real-world contexts. To solve the challenging problems facing our world, our students first have to acquire the skills necessary to fully understand the challenge in front of them. You cannot solve a problem if you don’t understand its true source. By teaching students to use empathetic interview techniques, they gain a deeper and more complete understanding of problems and the ability to identify solutions with the end user in mind rather than just themselves. It is the necessity to think beyond oneself that we find so profound. Habits of Mind and learning lines have formed the bedrock of fourth grade for many years. Design thinking is a complementary approach to learning how we learn and puts multiple Habits of Mind into action. In this project we saw fourth graders actively empathize, attend, problem solve, and be persistent. Through design thinking, our students are learning how to work with and support people of all abilities, to be strong public speakers, and to be flexible enough to let go of their own ideas and to support the ideas of others. Students are learning how to connect with one another by asking deeper questions in addition to being active listeners.